"If you're so depressed, why are you eating pizza?" Lucas (Corey Haim) is a little shrimp in a big pond. He's "accelerated," and a sophomore in high school at fourteen, though he could easily pass for twelve. He is also desperately unique�his idea of fun is catching bugs and running around with a massive butterfly net. At school, he resigns himself to being mocked by the football players and finds solace with his friends in the marching band (where he plays French horn, possibly the geekiest instrument of all). Maggie (Kerri Green) moves into town, and because it is summer, and she doesn't know anyone, she ends up spending most of her days with Lucas. He introduces her to his favorite things (their first date is to the symphony, though they listen to the music from the sewer). Lucas is convinced that Maggie is perfect. Maggie is just waiting for school to start. Lucas is a movie about idealized teenage love, the innocent attractions of youth more accurately defined as deifications. With first loves, even unrequited love, it doesn't matter if the relationship is unrealistic (if, say, you are a knobby-kneed 14-year-old, and she is 16 and a cheerleader), because the other person is perfect for you, and they'll eventually realize that you are perfect for them. The movie doesn't try to pull one over on the audience, either�it's pretty clear that things won't work out between Lucas and Maggie, and there is no forced happy ending to endure. Maggie and Lucas have long conversations about how the value system of high school, where jocks and cheerleaders are placed on pedestals, is corrupt. But once school starts, Maggie draws the attention of the captain of the football team (Charlie Sheen), and suddenly, to Lucas' surprise, she is trying out for the cheerleading squad. Certain he is going to lose his one true love, Lucas does the only logical thing a 90-pound weakling can do in this situation�join the football team. Corey Haim gives a wonderful, three-dimensional performance, and the fact that he's so good, so genuine and heartfelt, makes his post-teen idol descent into drugs and anonymity all the more depressing. Kerri Green is just as winning�Maggie doesn't just feel like a stock love interest. Charlie Sheen surprised me the most, but maybe that had more to do with the character. He isn't the typical popular jerk who picks on the wimp and steals the girl. I was happy to seem him treat Lucas as an equal, and to stand up for him when the other players picked on him. Sheen captures that everyman appeal instead of falling into the jock clich�. Winona Ryder, in her debut, has a small part as one of Lucas' pals, and though she has limited screen time, she gets across her character's longing for Lucas, the flipside of his feelings for Maggie. David Seltzer, the screenwriter, certainly got it right�high school crushes almost never turn into relationships. Seltzer also directed, and it's pretty clear that he poured his heart into the movie. Lucas stands head and shoulders above most other teen movies because it accepts its characters as genuine human beings. There is none of the gross out humor of the American Pie films, nor do the characters operate with the same self-aware irony as the denizens of the John Hughes universe. Duckie in Pretty in Pink is sort of like Lucas�the outsider in love with his best friend. But Ducky never once feels like more than a collection of catch phrases and sarcastic remarks. Lucas is uncomfortably genuine and relatable throughout. Not even when everything comes down to a "big game" does Seltzer take the easy way out. He doesn't sacrifice his smart dialogue and well-drawn characters for a cop-out ending. Lucas finds himself in uniform and in the game, but Seltzer doesn't have to cheat to earn him his big moment. I probably relate to this movie because I was something of an outsider in high school, well liked but socially irrelevant, and usually in love with one girl or another who wasn't planning on reciprocating anytime soon. But that isn't why I think Lucas is a good film. It succeeds because it is populated by real characters, and because it accurately recreates the atmosphere and emotion of high school and adolescence. I'd say it's a perfect movie for all the underdogs out there, but then, everyone says that even the popular kids feel like losers on the inside. Well, I don't buy it. And unless you can go back in time and make me retroactively popular in high school, I never will. Image Transfer Review: Lucas is offered in both 1.85:1 widescreen and open matte full-screen formats. Source material looks a bit worn in spots, with occasional flecks of dirt and grain showing up here and there. Colors, though, are fairly vibrant. Black level is decent, though shadow detail is only fair, with darker scenes lacking definition. I spotted some edge enhancement in spots, but artifacting wasn't a problem. For a film from the 1980s, this doesn't look all that bad. Audio Transfer Review: Audio is presented in the curious format of DD 4.0. This is a rather undemanding movie, and the mix handles the material fairly well. Dialogue sounds clear and natural, and the front soundstage, which handles most of the action, reproduces the score and sound effects with good dynamic range and infrequent directionality. Surround use is limited, though the rears do contribute atmospheric enhancement in a few scenes. Extras Review: Lucas may be an oddball, but his disc is run-of-the-mill. All that is included by way of extras is the trailer, along with clips for Bushwhacked, and Far From Home: The Adventures of Yellow Dog. 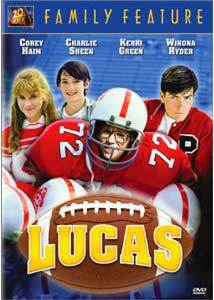 Lucas is one of the best teen comedies of the 1980s, but it is also, sadly, one of the least appreciated. Fox has done a nice job with this DVD, despite the lack of features, and with an MSRP of only $15, there has never been a better time to embrace your inner nerd. Now if I could just find my own Winona Ryder to embrace my inner nerd.